A content source is any source of content you would like to use to pull into your Cerkl. Oftentimes, this includes your organization's blog(s) or your other pages with an RSS Feed, as well as any other external content source you feel complements your organization's content. Providing more sources of content to your subscribers allows them to personalize their interests even more! If you don't approve of some content from another source, you can always disable it. To add, enable, or disable a content source, go to Content > Sources. 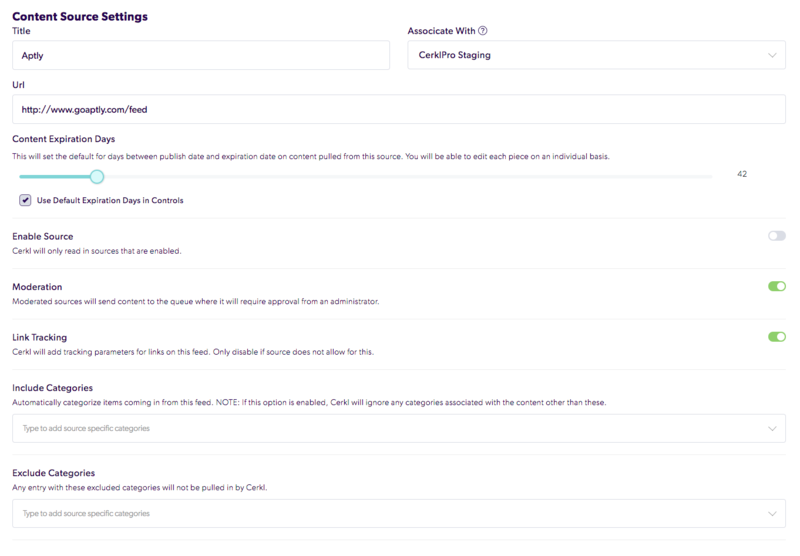 By clicking on the purple box on the right-hand side of the content source, you can edit it. By clicking the red trash can, you can delete the content source. This is super cool: You can even exclude tags from an external source! So if another site has shifted their topics for stories, you can exclude those tags if they are not relevant to your Cerkl's subscribers. You can select your tags before it's sent to your subscribers. Be aware: If you don't check the box, all the content that is pulled from the content source will not need approval before it's sent out. When adding in external content, we have a feature that allows you to include or exclude organizational categories to your RSS feed during the uploading process. Just click on the Include Categories or Exclude Categories field and Cerkl will autosuggest your organizational categories. From here, you can select which categories you want to add or omit from your RSS feed. You also can select to "Use Automated Email Content Expiration Days" which allows your content to expire after a set amount of days. You can also send your Content Expiration Days to "Never Expire". You can always override the Publish End Date before publishing.